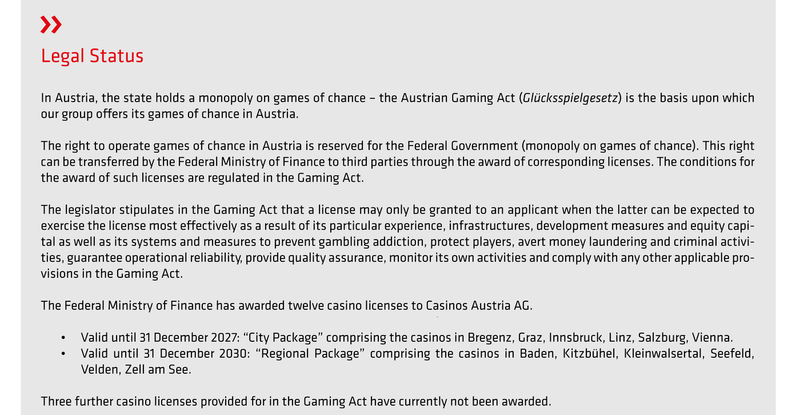 50 years ago – on 1 January 1968 to be precise – Casinos Austria’s first seven casinos opened their doors for the first time. In those days, their gaming mix was made up of the traditional table games of French Roulette and Baccarat. 50 years later, guests over the age of 18 can enjoy the thrill of gaming 364 days a year at a total of twelve casinos across the country. 235 gaming tables, 2,369 slot machines, 12 restaurants and superb event facilities attract more than 2.8 million guests each year. From Innsbruck with detours to Kitzbühel and Seefeld to Bregenz and on via the Kleinwalsertal valley to Baden and Vienna; or from Velden to Graz, Linz, Zell am See and Salzburg – each individual region in Austria is different, as are its twelve casinos. These casinos can be found in the magnificent setting of an historic city palace, surrounded by mountains or lakes, in bustling downtown locations or even in the splendor of a baroque palace.